Baby Bunch, Baby Bunch, Baby Bunch -- you are killing me! Where were you when my kids were born? I've already reviewed your adorable Baby Bunch Bouquet and Baby Egg Nests, and now you send me a sample of your Cupcake Onesies? I love them all so much that it's making want to have another baby just so I can use your beautiful (yet practical) baby gift items! Alfie might have something to say about that, so for now I'm just going to have to rave and rave about your products -- and, thanks to you, give one away............. so Bonggamom Finds readers, if you want to win a box of Cupcake Onesies, keep reading! The Baby Bunch has cooked up something fun - baby onesies in a variety of colors rolled to look like cupcakes, fresh from the oven. Pink for girls, blue for boys or yellow when you don't know! What could be more adorable than cupcake onesies? Pardon the pun, but these cupcake onesies are the sweetest things ev-ahh. You can tell these Cupcake Onesies are going to be a standout present from the moment you see them. In fact, they're packaged so beautifully that it would be a crime to hide them under wrapping paper, or in a gift bag. 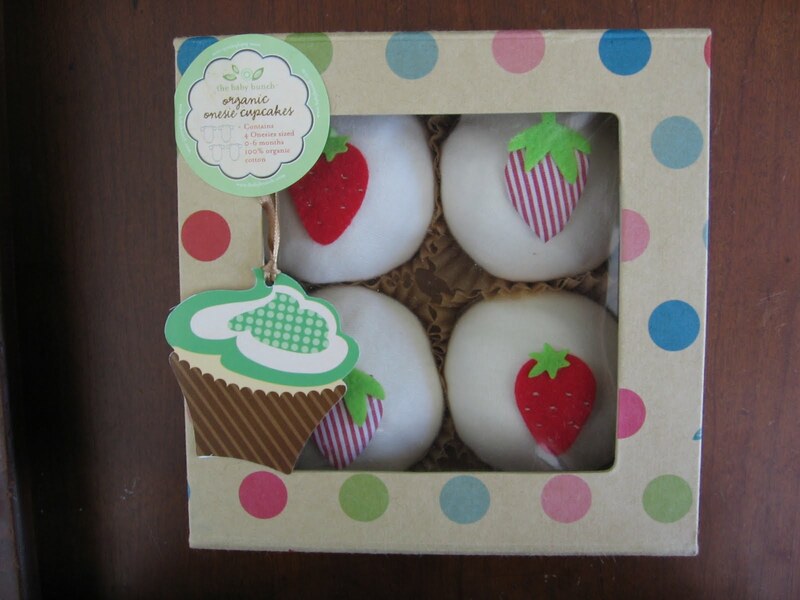 They come in a sturdy keepsake "bakery box" with a cute polka-dot pattern. Each cupcake is balled up, nestled in a paper cupcake liner and topped with a decorative fruit or flower. They look good enough to eat! The only thing I can think of to gripe about is that they don't make these cupcake onesies in larger sizes (i.e. 6 months to 1 year, or 18 months). Why should expectant moms have all the fun? I'd love to give this as a present to my 8-month old niece! The Baby Bunch has the perfect recipe for a baby shower present -- Cupcake Onesies and other high-quality baby gifts packaged in exquisite, unique ways. It's no surprise they've been featured on the Martha Stewart Show -- as Martha would say, They're a Good Thing! Win a box of Cupcake Onesies! One lucky Bonggamom Finds reader will win a box of four Cupcake Onesies in the color of their choice (blue, pink or yellow) from The Baby Bunch. 6) Follow The Baby Bunch on Twitter (1 entry). This giveaway ends at midnight PST on June 1, 2010; I will draw a winner at random on June 2 and post the winner's name after the winner confirms acceptance. For additional giveaway rules, click here. Good luck! 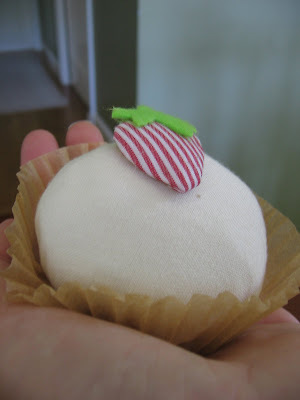 I would most love to give the Apricot organic (0-6m) bunch. It's lovely, organic, and gender-neutral. I'm loving any of the onesie bouquets that come inside the cute buckets. They would be so cute to take to a mom in the hospital to make the room pretty while she's waiting to go home (flowers that don't wilt! How cool is that?) and then decorate the nursery with them until she runs out of clean outfits and has to (boo hoo!) use one to dress the baby! It's not that they are any cuter than the lollipops it's just that I personally would get more enjoyment out of the bouquets. I am a follower of bonggafinds on twitter and tweeted about this giveaway. I love the blue baby egg nest! Even though I don't know the gender my friend's baby will be...girls can wear blue socks!! The moms are sometimes forgotton so I would be happy to give the Garden bunch. I love the lollipop rompers! I'd most like the Sweet Treat Candy Vase & Lollipop Rompers. Thanks. The crayon rompers would be a cute baby shower gift for my friend who is having a boy! Follow on blogger as Jaime! I would like to have the apricot bucket bunch! These would be perfect for our pregnant daughter: Box of Four Pink Cupcakes - $34.95 I also love those Crayon rompers. I would love to give or get the Blush Organic (6-12m) bouquet! I love the crayon rompers. I like the crayon rompers. I like the Big Blue Bunch. I really like the crayon rompers. My favorites are the mom gifts! I would love the kitchen or garden bunch. So adorable! 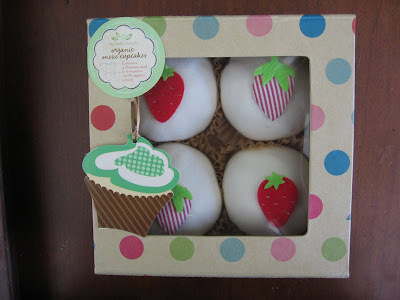 To give as a gift, I would love to give my sister who loves to bake a box of cupcakes. Love this!! My favorite is the Baby Bodysuit Lollipop. I love the winter bunch bouquet! I love the box of 6 Blue cupcakes and I would give it to my daughter. The Cornflower Organic 0 - 6 month Baby Bunch would make a beautiful shower gift. I like the box of crayons rompers. I love the Large yellow bunch. I subscribe to Bonggamom Finds updates. I'd love to give the garden bunch! I'd most like to receive winter bunch 0-6 m! So cute! The Lollipop Rompers would also be nice to give as a gift! I like the bucket baby bunch. It is really cute, and the bucket can be reused, making it more ecofriendly then some of the other sets. I would love to give a baby bunch boquet! The Crayon Rompers would be nice to give! Fan of Bonggamom Finds on Facebook! Following Bonggamom Finds on Blogger! Following The Baby Bunch on Twitter! I love the Pink PJ Cupcakes! I subscribed to your updates. Congrats to our winner: #69, twifanheather!